CORAL SPRINGS, Fla. – A woman was killed and a child was injured Tuesday morning in a crash involving a stolen car, police said. 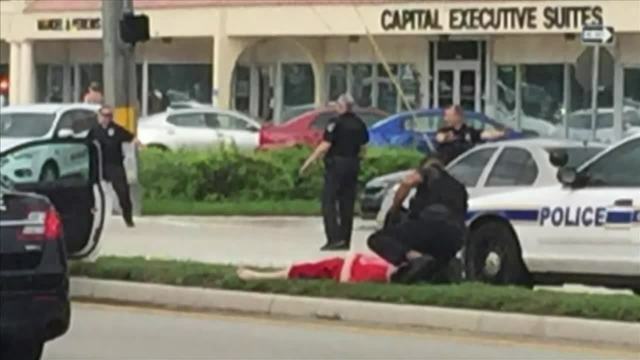 Coral Springs police said officers attempted a traffic stop about 10:40 a.m. on Sample Road when the driver of the car, Eric Abraham, 17, kept going and fled east. A witness photograph shows police tending to a boy who was injured in the Coral Springs crash. Police said the Toyota Corolla ran a red light at Sample Road at Northwest 101st Avenue and struck a Mercedes-Benz traveling north. A woman driving the Mercedes-Benz, Christianne Weiner, 53, was pronounced dead at Broward Health North. Her 11-year-old son was taken to Broward Health Medical Center with non-life-threatening injuries. Four people inside the stolen car were taken by ambulance to Broward Health North. A witness gave police video that shows officers with their guns drawn, ordering the people inside the car to get on the ground. Police said the Corolla was reported stolen in Miami Gardens. Abraham was taken to Broward Health North after the crash to be treated for injuries. He was later arrested on charges of vehicular homicide, aggravated fleeing and eluding causing serious bodily injury, reckless driving, driving without a license causing bodily injury or death and grand theft, police said. There were two juvenile passengers and one adult passenger in the stolen car, police said. The adult passenger was identified as Tyree Goodwin, 18. The passengers were taken to Broward Health North with serious injuries. OSCEOLA COUNTY, Fla. – Two teachers have been removed from a Ventura Elementary School classroom while deputies investigate allegations of child abuse, the Osceola County Sheriff’s Office said. In a letter written Friday, Principal Ashley Condo notified some parents that two teachers were reassigned to duties outside of the classroom following allegations they inappropriately restrained students by taping them to their chairs. Investigators were notified of the allegations Thursday, more than a month after the alleged misconduct happened, a Sheriff’s Office spokeswoman said. Hill said he would have preferred to have been informed in person or by phone because the letter left him wondering if his son was a victim. When Hill asked his son what he witnessed in class, he described one of his classmates having his wrists and his ankles taped to a chair. The School District of Osceola County said the teachers remain employed with the school as detectives investigate the allegations. The Department of Children and Families is assisting the Sheriff’s Office in the investigation. A DeSoto County teacher faces child abuse charges for allegedly shoving two paper towels down the throat of a special needs student. According to the arrest report, Carol Pauls held down a student and shoved two paper towels down his throat. Two teacher’s aides had to pull the boy away, authorities said. Pauls defends her actions claiming the child bit her and part of a paper towel she was holding. Parents at Nocatee Elementary School in Arcadia were surprised to hear what happened at the school and were angry the school didn’t tell them before. Else Whitaker said she knows Pauls and finds the incident out of character. Pauls’s Port Charlotte neighbors were also stunned to hear what happened. Law enforcement arrested Pauls Thursday afternoon at the school. The Department of Children and Families is also investigating. The Superintendent said as soon as they learned of the incident, they suspended the teacher. The $23,500 yearly tuition at the AEF School in Davie was supposed to ensure a nurturing learning environment for troubled students based on a novel South African educational method. Instead it was mental — and in at least one case physical — abuse that topped the private school’s curriculum, according to parents, ex-teachers, students and police. And in cases of bad language, administrators’ main teaching tool was a spoonful of hot sauce. The arrest this week of teacher David Michael Baier on two counts of child abuse for yanking a 12-year-old autistic boy out of a chair by his hair, then slamming him to the ground, opened a floodgate of complaints from parents about similar cases of abuse. The AEF School — or Alternative Education Foundation — has two campuses blocks apart in Davie and a third in Lantana in Palm Beach County. The school, formerly known as Kentwood Preparatory, is owned by the Fein family, which hails from South Africa. In 2010, according to the most recent publicly available tax records, it had 31 employees and generated $3 million in revenue. Lance Fein, its director, earned $119,000 that year. Fein did not respond to phone messages seeking comment. Students were punished for using inappropriate language by having to swallow hot sauce. “That’s child abuse,” Engle said. “Parents have been arrested for doing just that.” Particularly disturbing, the captain said, was a form letter sent to parents seeking permission for the punishment that one former teacher said occurred almost daily. But intense emotional and physical abuse is what parents cite in their complaints. Baier, 49, of Davie, is 5 feet 11 inches tall and weighs 270 pounds. Maynard said the school had a GAG, or Get A Grip policy, in which misbehaving students were sent to Principal Lynette Van Heyzen’s office for disciplining. If a child kicked Van Heyzen, “she would kick them back with her heel,” Maynard said. “Lance Fein pulled a child down the sidewalk all the way to his office,” the ex-teacher said. The two Davie schools have been involved in 28 lawsuits from 2007 to 2012, while the Lantana school had 32 suits between 2002 and 2011. In nearly all cases, it appears the school was suing parents for money owed. In one case, however, the school made a confidential settlement with a couple who had sued it. Police have been called to the Davie campuses 67 times from January 2010 to the present. Calls ranged from missing or suspicious persons to burglary to juvenile disturbances. Sean Hartman, who graduated from the school in 2009, filed a police report over being dosed with hot sauce after uttering a vulgarity in 2007. He vomited the initial mouthful, and was forced to ingest the rest. Experts say reward, not punishment, is a far more efficient means of shaping behavior. “There is no doubt that people will respond to punishment, but what tends to happen is in order for it to keep working you have to keep upping the ante and making the punishment harsher,” said Dr. Jeffry P. Brosco, associate director of the Mailman Center for Child Development at the University of Miami’s Miller School of Medicine. A former teacher at an alternative school in Davie is facing a new charge for alleged cruelty toward a 9-year-old autistic boy who attended a summer program there. David Michael Baier, 50, was arrested in August on two counts of child abuse for allegedly yanking a 12-year-old autistic boy out of a chair by his hair at AEF School and then slamming him to the ground. Baier has been free on bail while that case is pending. After Baier’s arrest last summer, Capt. Dale Engle of the Davie Police Department said the agency had received more than a dozen complaints from concerned parents. The accuser in the new charge claimed that Baier “pushed his head to the floor,” Broward County Judge John “Jay” Hurley said at a Monday morning court hearing. Hurley set bond at $2,500 on the new charge. Baier’s attorney, Steven Swickle, declined to comment. AEF School — or Alternative Education Foundation — has two campuses blocks apart in Davie and a third in Lantana in Palm Beach County. The incident which formed the basis of the first arrest was captured on video, Engle said. School officials did not respond to a phone request for comment Monday. The two Davie schools have been involved in 28 lawsuits from 2007 to 2012, while the Lantana school had 32 suits between 2002 and 2011. In nearly all cases, it appears the school was suing parents for money owed. In one case, however, the school made a confidential settlement with a couple who had sued, records show. FORT LAUDERDALE, Fla. – The mother of a 12-year-old autistic boy who was reportedly abused by a teacher at the Alternative Education Foundation school in Davie held a news conference about the case on Thursday. David Baier is accused of grabbing the student by his hair, throwing him to the ground, and pinning him down. Earlier in the day, a Broward County judge gave Baier, who faces two counts of child abuse, a $2,000 bond. The judge said Baier couldn’t return to AEF schools or contact the alleged 12-year-old victim. He posted bond on Thursday evening. Elias Hilal, the victim’s attorney, said his client hasn’t had issues at the school in the past, having been there for only one week. Hilal said the family wants to the school to take responsibility for the abuse of their son, adding that he has other clients who have made similar allegations against AEF schools only to be ignored. “They reported this to the school. We have other clients that also reported the same kind of allegations in the past to the school and the school’s completely ignored them,” said Hilal. Baier has been a teacher at the AEF schools for more than 25 years, his attorney told Local 10. He offered no other comment on the case. The school itself, AEF Elementary, has not commented.